Set the camera to P, Tv, Av, or M exposure mode. In these modes, you can tell the camera to base focus on a specific autofocus point. Again, manual focusing is a simple matter of setting the switch on the lens to the MF position and then twisting the focusing ring on the lens. To use autofocusing and specify an autofocus point, take these steps. When you do, you see the AF Point Selection screen on the monitor. 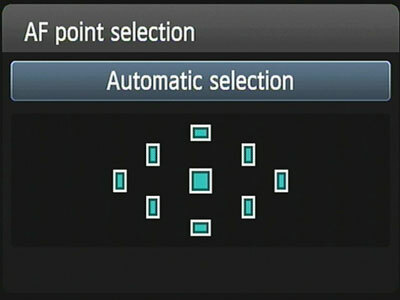 From this screen, you can choose one of two modes: Automatic AF Point Selection, in which all focus points are considered, or Manual AF Point Selection, in which you choose a single focus point. In Automatic AF Point Selection mode, all autofocus points appear in color. 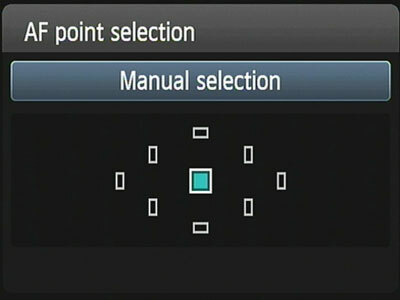 In Manual AF Point Selection mode, only one point is selected and appears in color. You can check the current mode by looking through the viewfinder, too. When you press and release the AF Point Selection button, all nine autofocus points turn red in the viewfinder if you’re in Automatic AF Point Selection mode. A single point turns red if you’re in Manual AF Point Selection mode. Rotate the Main dial. This option is easiest when you’re looking through the viewfinder. Press the Set button. 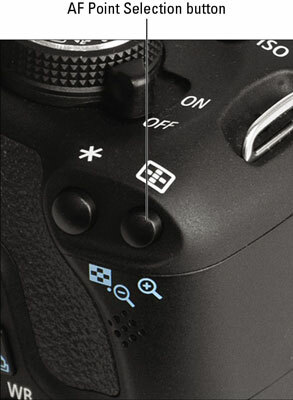 Pressing the button toggles the camera between Automatic AF Point Selection and Manual AF Point Selection with the center point activated. Specify which AF Point you want to use. You can either rotate the Main dial or press the cross keys to select a point. When all autofocus points again turn red, you’ve cycled back to automatic AF Point Selection mode. Rotate the dial or press a cross key to switch back to single-point selection. That’s all there is to it. After you select the autofocus point, just frame your shot so that your subject falls under that point and then press the shutter button halfway to focus.